We are moving into the tail end of the month long campaign in October by the Breast Cancer Foundation to raise awareness for breast cancer. Cancer, of any form is trecherous but breast cancer, in particular has an eery sense of relevance and reality among every woman. I think the heightened sense of relevance for most of us women stems partly from the fact that it is one of the most common form of cancer among women and partly from the fact that it strikes at the very core of what represents and celebrates our womanhood. I believe everyone of us have had friends who had been afflicted by breast cancer or had a close scare of getting it. I myself, have 2 friends who are breast cancer survivors. In addition, I also went through the anxiety of wondering if the fibroid lumps in my own breast would be malignant. I recall some years back, L and myself were enjoying an intimate moment when he suddenly told me that he felt something different in my right breast. There was an awkward uneasy pause and immediately next day, I made an appointment with the doctors to have a mammogram scan. True enough, the mammogram picked up a lump that was quite sizeable. The doctor then immediately proceeded with a Ultra sound scan for a better look at the lump. The accessment came only a few days later. Luckily, after studying the ultrasound films, the doctor told me that from the shape and the form of the lump, it did not look malignant. The better way to handle this would be to have an operation to remove the lump and perform a biopsy to be sure. Alternatively, I could let it stay and have them monitor the lump over a period of 6 to 12 months to see if the lump would change any further. Fearful of the prospect of going under a knife, I chose the second option. For the next 6 months, I went for 2 more ultrasound scans, both times, the lump remained unchanged. When I went for the yearly health screening a year later, I made sure I brought my films with me for the doctor to compare against the new scans. Nowadays, I make sure I do a mammogram and ultrasound scan 2 times a year and it still slightly freaks me out whenenver I do my scans, fearful that they may find something unpleasant. In Singapore, the Breast Cancer Foundation (BCF) is a non-profit organisation that strives to increase awareness of breast cancer, promotes early detection and treatment of the disease, and provides support services. I have never experienced the trauma of going through cancer treatment and I fervently pray that I will never have to experience it but for those who have been dealt a shorter hand in life, they will need all the support they can get - be it financial or emotional.
" Are you obsessed with the right things? The difference between a pimple and breast cancer is that of life and death. Regular breast checks are the best way to fight cancer. Show support for the women in your life by purchasing a Pink Ribbon." 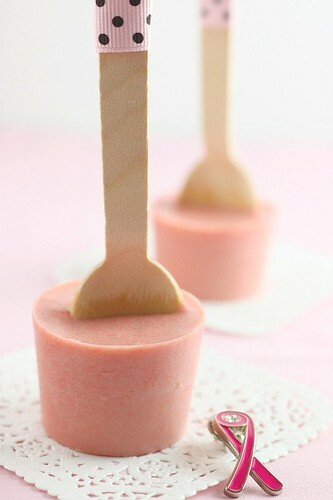 In support for the Pink Ribbon Campaign, I am sharing here my simple recipe on Raspberry White Chocolate Pops which I first saw at the Donna Hay store. These chocolate pops are supposed to be stir- melted into hot milk to yield a creamy white chocolate drink. In addition, I am also helping the Singapore Breast Cancer Foundation to sell their Pink Ribbon Collar pins in the hope to raise funds for their support efforts. Each pin costs S$5 and I will be returning the pledge cards to BCF by 15th Nov. For those who wish to purchase a pin, please drop me a comment or email with your contact detail. Due to logistics limitations, I will only be able to open this fund raising to those who are residing in Singapore. I hope to get your support for BCF. Thank you! 1. 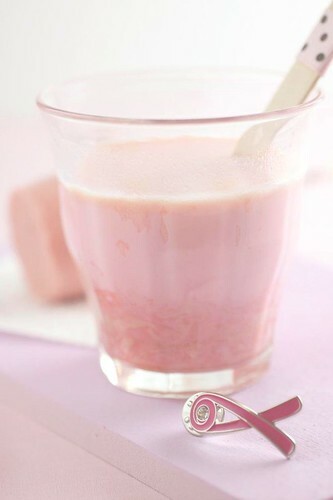 Melt white chocolate in microwave oven or over a bain marie. 2. Add colouring and extract and stir until smooth with a spatula. 4. Refrigerate until chocolate is set. 5. To enjoy, heat up a cup of milk and stir (4) into the milk. glad to see another supporter :) by the way, you know how you put liquids into the chocolate right, won't it become dry and sieze? @Grub : Actually I don't. I know chocolates hates moisture. That's why I did not try to incorporate fruit juice. I did that once and it curdled up. I use alcohol based extract instead - luckily I have a good quality organic raspberry extract which I bought in the US. Shirley, I'd have to say this is a very good and meaningful post that reminds us, especially women, of the threat that breast cancer may bring us. Yes, there are people around me who were or have been affected by breast cancer and other forms of cancer, too. I'm sure everyone of us would appreciate your efforts in hammering the whole idea into our heads. Health is something that money can't buy. Thank you, Shirley! Take care, K? So simple? I must make these!! Penny, actually it is easy.If you would put them in a nice cellophane bag, bundle it with a pretty ribbon, it could be a nice Christmas gift. pink is such a sweet colour and these pops look very very pretty. good for you on the support and effort you are making in bringing about breast cancer awareness! So nice to see that you are a supporter. We need more people like you that brings awereness to others. The pops look so very pretty! At first, I thought they were ice cream pops. Haha. Any check ups freak me up too, becos I came from a family with bad cancer background. It won't be pleasant to get any bad news. A most beautiful post in all aspects..Just beautiful. That little girl is just so perfect..I had never seen that.. Thanks for alerting us with your personal experience. This is not only a simple and nice recipe but also a meaningful post. Good luck and take care : )! Shirley, this is absolutely brilliant. I do wish I was in SIN...would have pledged to a cause close to me heart! Great post =) and your pictures are amazing as always. Hi Shirley. My mom was diagnosed with breast cancer years ago and was given six months to live. Luckily she survived but breast cancer is always a concern for us. Thank you for the post and helping to raise awareness. Thanks for sharing your experience too. The pops are gorgeous. I'm making them very soon! Thank you for your detailed post. More people do need to take notice ! Just few days ago, my friend and I were still discussing whether to go for test as we both hit 40s. I am still getting that goofy feel. Give me some courage! Edith, if you've never had a mammogram, you should go for it. It is really a quick and easy test. I started doing scans before I hit 40. You are very clever! This is a great idea to support the breast cancer awareness! I love the idea! Shirley, beautiful post and so easy to make. You mentioned your spoons are from Donna Hay. Is there a store here in SG? Simply beautiful and a lovely post for a very worthwhile cause. Shirley, I love this post and definitely a very good cause. The pops look really good and I absolutely adore the Donna Hay styling. Great post for a great cause, Shirley! I love the way how it looks. It's cute, neat and tidy. Shirley, I thought these are ice cream pops initially! And thanks for this meaningful post, sharing your experience with us and bring out to make more awareness. Shirley, Thanks for sharing this pink and meaningful post, and your story. My advise to you is better you remove the lump as sometime good lump will turn to bad lump. This was happened to me, I removed a lump straight away when doctor told me the same thing like what your doctor told you, I was about 20++ at that age. Take good care dear. Thats a very meaningful writeup you have there. Its very well written and the pics looks great. well done! Do you mind bringing along the pins when we have our next meetup? I suppose we will be meeting before 15nov. I am thinking of purchasing one from you. Thanks, ZY for your support! I am traveling now in Korea and will email you shortly. Lovely post and a great reminder for us ... I had my 'scare' this year and ultra sound was needed after mammograms picked up some shadows... all was good in the end..
What a great cause, Shirley. Thanks so much for sharing your story. My mom has fibroids as well and it's always scary when she goes for her check-ups. 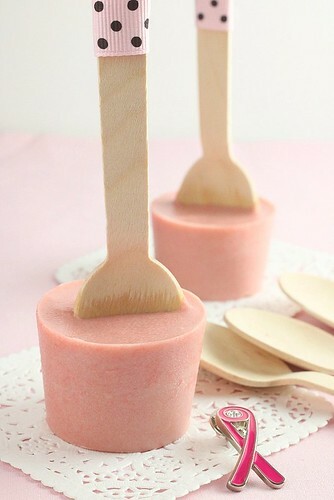 These ice pops look delicious and are filled with such dreamy creamy flavors. Hi Zahra, Thank you for stopping by. The wooden spoons are actually disposable. Donna Hay's website does not offer on-line shopping just yet. Try to google disposable bamboo spoons - perhaps you can find something. Good luck! Oh I saw these on another blog before and they're genius! I love your pretty version of these. The pops look gorgeous! I love the colours and the style of the pops. Thanks for sharing your story - it is a frightening thing to happen. These pops look wonderful - a lovely idea that I have never seen before. Love the colour of these pops and love even more that it's in support of such a deserving cause.